Seed of grams are soaked in water. Four soaked seeds are placed between two Petri dishes in cotton. North, south, east and west are marked on the dishes. The dishes are fixed on a stand. The seeds are allowed to grow. After some days the position of dishes is changed. The stem and root shows curvature. It is found that the stem always move upward. Hence it shows negative geotropism. Root always bents downward. It shows positive geotropism. Plant faces stimulus of gravity equally on revolving klinostat. Therefore, curvature is not caused in the tips of roots and stem. It is believed that the stimulus of gravity is received by root cap. The root tips were removed from roots of pea. They did not respond to the gravity. It is believed that root cap produces an inhibitor on the lower side of the roots. It stops the growth and the root bends down. Stem: The high concentration of auxin stimulates cell elongation in stems. More auxin accumulates on lower side. It increases the growth on lower side. Therefore, the stem curves upward. Root: High concentration of auxin inhibits the cell elongation in roots. Auxin accumulates on the lower side in a horizontally placed. Therefore, the root moves downward. Roots are much more sensitive to auxin than the stems. Ethylene is synthesized when auxin accumulates in root. It inhibits the root growth. Current evidences show that the Cholodny — Went theory is not valid. 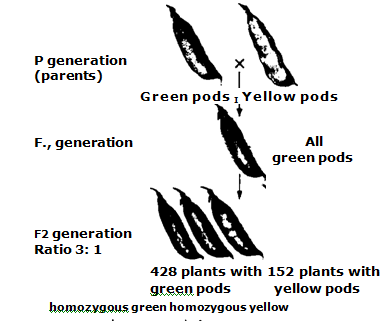 The unequal distribution of auxin does not play much role in the geotropism. Cotlieb Haberlandt and B. Nemec proposed this theory. According to this theory the stimulus of gravity is received by statoliths. Statolith is specialized plastids called amyloplasts. The cells containing amyloplasts are called statocysts. These amyloplasts have large dense starch grains in them. The starch grains settle in the cells of the root cap in response to gravity and receive the stimulus of gravity. The statocysts are present in tips of coleoptiles, the root endodermis, and the sheath of vascular bundles of hypocotyls, epicotyls, and young foliage. The Statolith fall on the endoplasmic reticulum in a different part of the cell.It releases calcium ions there. High concentration of calcium ions activates calmodulin. Calmodulin is a small protein present in the cells. Calmodulin activates several enzyme systems. These enzymes activate the growth of the cell. 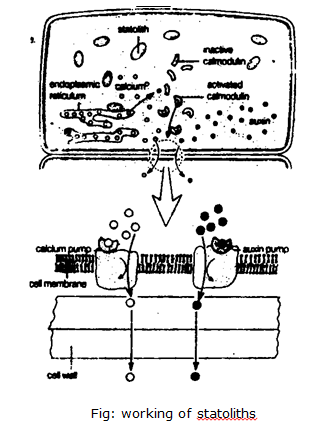 Calmodulin switch on the pump for calcium ion and IAA present in the cell membrane. Calcium ions and IAA pass across the tissue of the stern or root from cell to cell. It increases or decreases growth in different regions. I. Some mutant maize has smaller amyloplasts. They are less sensitive to the stimulus of gravity. 2. The treatment of coleoptiles with gibberellins and kinetin at high temperatures destroy the amyloplasts. Therefore, these stem and coleoptile do not respond to stimulus of gravity. The starch grains reappear in amyloplasts after sometime. Therefore, the sensitivity reappears. The geotropism in root is inhibited with the removal of cap. It is restored with the regeneration of cap. Therefore, some plant physiologist believes that root cap regulates the geotropism. It has been proved by experiments. In one experiment half of the root cap of maize root tip was removed. The root develops curvature toward the side of the remaining half cap. In another experiment the maize caps are placed on the tip of lentil roots. It decreases root elongation. These observations suggest that the root cap cells produce abscisic acid. Abscisic acid is a growth inhibitor hormone. It is transported into the elongation zone the action of gravity. It accumulates there and inhibit the cellular elongation on the lower side of the roots placed in a horizontal position.